Alexander JOHNSTON (c. 1755 – 1810) is Alex’s 6th Great Grandfather, one of 128 in this generation of the Miner line. Alexander Johnston was born about 1755 in Ireland. He married Esther RANKIN or Jan Peery. Came to America in his parents in 1797, settling in Crawford County Pennsylvania in 1800. Caleb Luce, September 23, 1797, 100 acres in Conneaut, Crawford, Pennsylvania, settled under contract and deed granted Alexander Johnson, assignee of Luce. Alexander died after 1810 in Crawford County, Pennsylvania. Except a narrow strip along the western line, which was owned by the American Land Company, the Conneaut Township was included within the domain of the Pennsylvania Population Company. The agent of this latter company was Jabez Colt, who, in order to stimulate immigration to these lands, in the summer of 1797, or earlier, engaged the services of a half dozen or more sturdy, young, unmarried immigrants and made an improvement alled Colt’s Station, in the eastern part of the township, and probably at the south end of the dividing line, between Tracts 710 and 711, or in Tract 715. For several years they remained here, but the place did not flourish and the land agent abandoned the settlement and made another improvement in what is now Pine Township. The following statement shows the condition of the Population tracts in 1812, when the company closed its business – the number of the tract, name of settler, date of contract, number of acres, contracted for and its final disposition. Each tract contains an area slightly exceeding 400 acres. Tract 683, Ezekiel Murdock, Oct 27, 1797, 200 acres, deed granted Amos Line, assignee of Murdock; 684, Eliphalet Beebe, Nov 9, 1797, 200 acres, deed granted Amos Line, assignee of Beebe; 685, Samuel Hungerford, Nov 9, 1797, 200 acres, slightly improved, then abandoned; 686, David Smith, Nov 9, 1797, 200 acres, slightly improved, then abandoned; same tract, George Cook, Mar 27, 1805, 100 acres, abandoned; 687, Caleb Luce, September 23, 1797, 100 acres, settled under contract and deed granted Alexander Johnson, assignee of Luce. All the above, except the last named, were intruded upon in 1801, 1802 and 1803, but abandoned after a two or three years’ settlement. The following were tax-paying residents of the Conneaut township in Crawford County Pennsylvania in 1810: Alexander JOHNSTON, William LATTA and Samuel LATTA, Robert Martin, John Parr, Samuel Potter, William and Samuel RANKIN, Samuel Brooks, Thomas Crockett, Henry Frey, Obed Garwood, William Hill, Thomas McGuire and Rebecca Paden. Alexander Johnson was a native of Ireland, and settled on Tract 687, in the northeast comer of the township, where he remained till death, leaving five children: William, John, Mary (Lopeman), Jane (McDowell) and Esther (Crockett). Esther’s husband Thomas B. Crockett was born in 14 Nov 1770 in Donegal, Ireland. Thomas died 27 Apr 1823 in Linesville, Crawford, Pennsylvania. Esther and Thomas married 16 Nov 1797 in Cumberland, Pennsylvania. Thomas Crockett was an Irishman, and settled on Tract 723, where his son then resided [see above]. He was a farmer, and was drowned near Linesville. i. Jane Crockett b: 15 Sep 1801 in Cumberland, Pennsylvania; d. 1 Apr 1871 in Crawford Co, Pa; m. Sam Garwood (b. 1797 in Of Crawford Co., Pennsylvania – d. 1849); In the 1850 census, Jane was a widow in Conneaut, Crawford, Pennsylvania. iii. Mary Crockett b: 1806 in Crawford Co, Pa; d. 1845 in Crawford Co, Pa; m. 2 May 1818 – Crawford County (Crawford), Pennsylvania to Luman Laurence (b. 20 Aug 1798, Albany NY – d. 2 Nov 1867 – Crawford County, Pennsylvania) His parents were Oliver Lawrence and Patty Ann Waite. iv. Margaret Crockett b: 28 Dec 1807 in Conneaut Township, Pa; d. 8 Mar 1893 in Crawford Co, Pa; m. Judah Warren (b. 1799 Massachusetts – bef. 1860 census); In the 1850 census, Margaret and Judah were farming in Conneaut, Crawford, Pennsylvania. v. William Crockett b: 2 Feb 1811 in Conneaut Township, Pa; d. 9 Nov 1852 in Dosset, Ashtabula, Ohio; m1. Rhoda [__?__] ( – d. 1844 in Crawford, Pennsylvania); m2. 4 Sep 1844 in Ashtabula, Ohio to Sally Ann Cadwell (b. 29 Dec 1814 in Farmington, Hartford, CT – d. 14 Feb 1885 in Dorset, Ashtabula, Ohio) In the 1850 census, William and Sally Ann were farming in Pierpont, Ashtabula, Ohio with five of their own children, four Cole children and Newell Hicks. vi. Esther Crockett b: 27 Mar 1813 in Conneaut Township, Pa; d. 17 Oct 1886 in Crawford Co, Pa; m. 1 Sep 1832 Crawford Co, PA to Joseph Samuel Garwood (b. 25 Aug 1805 in Conneaut Twp, Crawford Co, PA – d. 03 Jun 1887 in Crawford Co, PA). In the 1850 census, Joseph and Esther were farming in Summit, Crawford, Pennsylvania with eight children at home. vii. Sophia Crockett b: 6 Jul 1815 in Crawford Co, Pa; d. 20 Jan 1886 in Conneaut township, Pa; m. Merrick Thayer (b. 14 Mar 1812 – d. 9 Mar 1894 Conneaut Center Cemetery, Conneautville, Crawford County, Pennsylvania) In the 1870 census, Merrick and Sophia were farming in Conneaut, Crawford, Pennsylvania. viii. Thomas B. Crockett Jr. b: 1820; d. 17 Oct 1889 in Crawford Co, Pa; m. Julia C. Homer (b. 7 May 1819 in Oneida, Onondaga, NY – d. Aft 1880 census) In the 1860 census, Thomas and Julia were farming in Conneaut, Crawford, Pennsylvania. 28 Sep 1873 to Ella Ephrasia Fowler (1854 – 1945) In the 1860 census, William and Martha were farming in Conneaut, Crawford, Pennsylvania. Mary and Andrew Lopeman had nine children: Elizabeth, John, Alfred Arthur, Mary, Catherine Ann, Hugh A., Nancy Anne, Margaret and Jane. Andrew Lopeman was born about 1780 in Franklin Co., Penn. Andrew died 12 Dec 1834 in Kittanning, Armstrong Co., Pennsylvania. Some genealogies state that Mary also died in 1834 in Kittanning, but I found her living with her daughter Nancy A Acker in District 44, Ohio, Virginia [Wheeling, West Virginia] in the 1850 census. Almost all of the Lopemans in the US, descend from Andrew Lopeman. Family lore suggests that Andrew was from Holland, or possibly Belgium, or less likely from Germany. The earliest record we have for him is the 1810 Franklin Co., PA, census. One researcher and author of a genealogy book on Andrew has Mary’s last name as Crocker, but the consensus is that she was more likely Mary Johnston, born about 1780-1783 in Kilkenny, Ireland. Andrew and Mary’s son John married a Crockett according to family legend. The sparse records we have on Andrew suggest that quite a few friends, neighbors and relatives were Irish, and some of us have speculated that, even if his family origins were Dutch, he might have come to the US via Ireland. We have also wondered if similar names such as Lohrman or Lowman are distant branches of the family. From: Joan Miller, gggrand-daughter of Josiah Ralph Lewis. “The following was written on 18th Feb 1833 and recorded the 14th Dec 1844. I copied it as closely as possible from the original on microfilm. Page 2…and equitable among our said children. Lastly, I do hereby nominate, constitute and appoint my said wife_________,_________and George (Brodhand??) executors of this my last will and testament declaring null and void all other wills heretofore made by me and pronouncing this to be my last will and testament. In the 1850 census, John was farming in District 29, Lee, Iowa. His farm was in Knox County. His church was in Fulton County, Illinois. Like its neighbor to the south, Fulton County, for its Spoon River Drive, Knox County is also known for a similar scenic drive fall festival the first two weekends in October, the Knox County Drive. ii. Mary Lopeman (twin) b. 24 Sep 1808 in Somerset, Pennsylvania; d. 20 June 1871 in Northunberland, England; m. 17 Oct 1828 Pine, Armstrong, Pennsylvania to John Graham (b. 4 Apr 1805 in Pennsylvania – d. 26 Dec 1880 in Benton, New Lincoln, Oregon with his daughter Elmira) His parents were Robert Graham and Nancy Montgomery. In the 1850 census, John and Mary were farming in Pine, Crawford, Pennsylvania with ten children at home. In 1860, they had moved to Jennings, Crawford, Indiana. iii. Elizabeth Lopeman (twin) b. 24 Sep 1808 in Franklin County, Pennsylvania; d. 23 March 1896 in Metamora, Lapeer, Michigan. In the 1850 census, Elizabeth was living with her brother John in Lee, Iowa. iv. Catherine Ann Lopeman, b. 18 Oct 1810, Franklin PA, d. 23 Mar 1896, Dryden, Lapeer County, MI; m. 02 May 1833 in Kittanning, Armstrong, PA to Nathan Ellsworth Lewis (b. 18 Mar 1807 in Middlesex CT – d. 20 Feb 1888 in Dryden, Lapeer, Michigan), His parents were Nathan Andrew Lewis and Constant Butler. 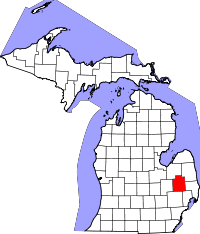 Catherine and Nathan moved to Lapeer County, Michigan in 1848. Catherine Ann Lewis died March 23, 1896 of paralysis, the disease attacking her March 1. Funeral services for were held at Thornville Church, where Rev. Harper preached from Numbers, 23rd chapter and a part of the tenth verse. Undertaker Sissons, of Imlay City, laid the remains to rest in Thornville cemetery. Catherine Ann was born Oct. 18, 1810, at Franklin, Penn., and was 85 years, 5 months and three days old. She married Nathan Ellsworth Lewis, May 2 1833, at Kittanning, Penn living there until May, 1839, when they moved to Bruce, Macomb Co. Mich. they moved again in 1848, to Dryden, Lapeer Co., and have lived since in the townships of Dryden, Attica, Goodland, and Metamora. Mrs Lewis leaves four sons and two daughters to mourn her loss: O. A. Lewis, of Metamora, at whose home she died; Wm I. of Dryden; Josiah R., of Deford; Samuel B., of Hunters Creek; Mrs Mary Utley, of Goodland, and Abigail R., of Deford. Two sons died in infancy. Her eldest son, Nathan Andrew, died April 5, 1889, at Deford and her fifth son, Edwin A., died Dec 13, 1893, at Marion, Mich, and was buried at Morice, Mich. She joined the christian church upwards of forty years ago, taking a letter some time afterward to Dryden M. E. church. Nathan Ellsworth Lewis was about 7 years old when he moved with his parents to Pennsylvania and came four years later to Milam, Erie Co. Ohio. In 1832 he removed to near Pittsburgh, Penn and a year later married. In 1839 he and his family removed to Romeo Mich. and in 1848 to Dryden where he lived until one year of his death. He died at the home of his daughter Mrs Utley of Goodland. In the 1860 census, Nathan E. and Catherine were farming in Dryden, Lapeer, Michigan. Although about 54 years old when the war broke out, he enlisted in the 7th Mich. Infantry. Aug. 1861. He was soon discharged on account of his age, but determined to serve in the army, he again enlisted Oct 26, 1861, in Co., H, 10th Regiment, Michigan Infantry. When he was hospitalized for illness it was discovered that he had lied about his age to join the service and was 56 years old at the time and transferred to Veterans Reserve Corps. He remained in service until Feb 6, 1865 when he was honorable discharged. The Tenth Infantry was organized at Flint, completing its formation in February, 1862. It was composed of the following local companies, the “Byron Guard”, of Byron, the “Saginaw Rangers” of Saginaw, the “Orion Union Guard” of Orion, the “Sanillac Pioneers” of Sanilac, the “Scarret Guard” of Port Huron, the “Holt Guard” of Almont, the “Lum Guard” of Memphis, the “McClelland Guard” of Pontiac, the “Genesee Rangers” of Flint and the “Dickerson Guard” of Hillsdale. The Regiment left the state April 22, 1862, under the command of Colonel Charles M. Lum, joining the army under General Hallock, at Pittsburg Landing, Tenn., being assigned to the Second Brigade, General Pope’s Division. The Tenth was in the presence of the Confederates the moment it reached its destination, commencing at once a series of marches and skirmishes that occupied every day, together with the hard work of building trenches and fortifications. When the Confederates retreated from Corinth the Tenth went into camp at that place, where it remained until June 20th, enjoying a much needed rest, when it was ordered to Tuscumbia, Ala. Detachment’s of the Regiment were sent out from this place to occupy certain positions and act as provost guard. In September the Tenth marched to Nashville, where it was engaged in building fortifications, taking part in reconnaissances, guarding trains, all the while suffering severely from short rations. The Regiment was then assigned to the First Brigade, Second Division, Fourteenth Army Corp, Army of the Cumberland. During the winter the Regiment was constantly on duty, making many and long marches; but, met with no serious loss in battle. It had frequent contacts with the southern forces while guarding trains. losing a number of men in these engagements. In September, 1863, the Regiment was at Bridgeport, Ala, crossed the Tennessee River near Chattanooga, arriving at Chicamauga Station the 26th. It was constantly in motion, occupying a number of towns during the fall and summer. The Regiment veteranized at Rossville, 335 men re-enlisting on the 6th of Feb. 1864, with the expectation of going home for a 30 day furlough. While anticipating such a pleasant event, orders were received for the regiment to move with the army in a general advance toward Dalton, Ga. At Buzzards Roost, Feb. 25th, the Confederates were found strongly fortified, and the Tenth was pushed upon the confederate works, meeting a storm of grape and canister, causing a loss of 13 killed, 35 wounded and 17 missing, for a total loss of 65 men.The following month the Regiment was returned to Michigan, arriving at Detroit, March 11th, and was furloughed for 30 days. May 11th., the Tenth was back in Chattanooga, thence to Georgia, marching by way of Dalton and Kenesaw Mountain, crossing the Chattahoochie River the 17th, then taking part in the Siege of Atlanta. The Tenth was a part of General Sherman’s army and participated in the march from Atlanta to the Sea, then after a number of skirmishes with the southern defenders, arrived before Savannah, December the 11th. When that city fell, the Tenth encamped there until Jan 20, 1865, when it started with the balance of the army on the campaign in the Carolinas. The Tenth crossed the Savannah River at Sister’s Ferry, Feb. 6th, then was engaged with the Confederates at Fayetteville, N.C., March 11th, crossing the Cape Fear River on the 12th. The Regiment skirmished heavily with southern forces at Averysboro, N.C. the 16th, then fighting in the battle at Bentonville on the 19th. The Tenth then marched on to Raleigh, reaching Goldsboro on the 23rd. The line of march was then continued to Richmond, Va., as that city had fallen into the hands of Union troops upon the Surrender of General Lee. On the 10th of May, 1865, the Regiment was marched to Washington, D. C., where it took part in the Grand Review with General Sherman’s army on the 24th. Seller of the land to Hugh Lopeman, an Indenture for 102 acres and 7 perches for the price of $306.13. The land was purchased from Mr. George Kribbs and his wife, Susanah, and is dated April 22, 1851 – the land being part of a Tract laid off in 1806 to William Brown. The Document is 16 X 22 inches and in very good condition. When folded it is 4 X 8 ¼ inches and written on the outside is Geo. Kribbs to Hugh Lopeman. This land lies in Clarion County, Penn. close to Venango County in N. W. Penn. Later Hugh Lopeman and family would move to Iowa and then to Missouri. In the 1860 census, H A and Susannah were farming in Big Creek, Cass, Missouri. During the Civil War they would move to Delaware Township, Leavenworth, Kansas for protection. Hugh enlisted as a Wagoner on 17 July 1863 at the age of 44 in Company M, 5th Kansas Cavalry Regiment. He died of disease Company M, 5th Cavalry Regiment Kansas on 11 Apr 1864 at Fort Leavenworth, KS. The regiment lost a total of 268 men during service; 2 officers and 45 enlisted men killed or mortally wounded, 2 officers and 219 enlisted men died of disease. Hugh’s son Alexander (b. 1841) enlisted in Company H, Kansas 16th Cavalry Regiment on 08 Mar 1864. Promoted to Full Private. Mustered out on 06 Dec 1865. Hugh’s son James A Lopeman Sr was born Mar 1853 in Pennsylvania. He married Forest Amos (b. 2 Jan 1864 in Iowa – d. 13 Aug 1916 Iowa) Family legend about a Cherokee wife may have stemmed from the land ownership in Enid, OK. James had a plant nursery there. Once oil was struck in the area, the rights belonged to the local Indians. In 1893 he married a woman named Mary, although he was already married to Forrest. He put Forrest in a mental institution in Iowa. In the 1900 census, James and Mary were living in North Enid, Garfield, Oklahoma, where John was a nurseryman. Based on these facts, some assume that he did that to gain the oil rights by marrying an Indian named Mary. James died 12 Apr 1939 in Enid, Garfield, Oklahoma. Prior to the Land Run of 1893, Garfield County was named O County and was part of the Cherokee Outlet, occupied by the Cherokee people following the Treaty of New Echota and the Cherokee trail of tears. Historically, the area was a hunting ground for the Wichita, Osage, and Kiowa tribe. 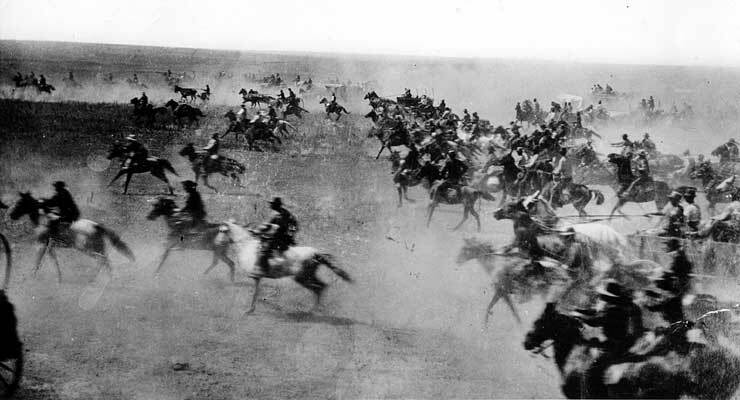 Horses rush forward during the 1893 run. The Land Run of 1893, also known as the Cherokee Strip Land Run, marked the opening of the Cherokee Outlet to the public. The run happened on September 16, 1893 at noon with more than 100,000 participants hoping to claim land. The land offices for the run were set up in Perry, Enid, Woodward, and Alva with over 6.5 million acres of land. It was the largest land run in United States history. 1893 was the same year James married Mary. vi. Nancy Ann Lopeman b. Abt 1822 in Pennsylvania; d. 7 Feb 1899 in Akron Summit County, Ohio; m. 22 Oct 1846 Wheeling (West) Virgina to William Hood Acker (1822 – ) In the 1850 census, William and Nancy were living with two young girls Elizabeth and Vandalia and Nancy’s mother Mary in District 44, Ohio, Virginia where William was a wagoner. After William died, Nancy married [__?__] Thomas. In the 1880 census, Nancy Thomas was a widow living with her son-in-law and daughter John and Vandely Sinclair in Jamestown, Mercer, Pennsylvania. John was a harness maker. In the 1860 and 1870 census, Alfred and Sarah lived in Steubenville, Jefferson, Ohio. Mary Elizabeth Lopeman, born 1835, daughter of Alfred Lopeman and Sarah Stiveson Lopeman. The Lopeman family were living in Armstrong County, Pennslyvania in 1850 in the township of Manor. 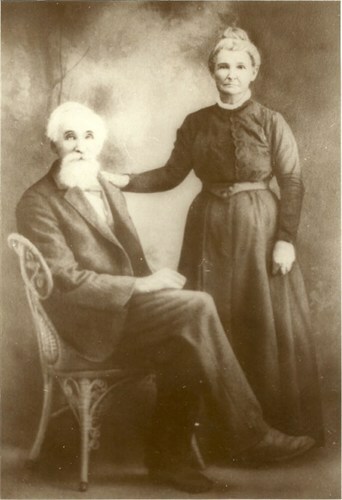 Sarah Stiveson’s parents, Tobias and Jane, were also living in the county in 1850. It is unknown when the family first came to Armstrong County. Mary Elizabeth Lopeman married first to John Welsh who died in the Civil War. She married second William Boggs of Butler County. She died in 1920 and is buried in the Evans City cemetery. FALLING LEAVES Alfred Lopeman Alfred Lopeman died at his residence on South Fourth street yesterday at eleven o’clock, in the 75th year of his age. Mr. Lopeman was born in Pennsylvania January 28th, 1806, he was married in 1832, and came to Steubenville about twenty-eight years ago. For some years past he has been too feeble to work, but until age came upon him, he was a most industrious man, having been employed in the nail mill for over twenty-five years. He was the father of thirteen children, nine of whom survive him. These are all married but two, and are living in various parts of the country. They are, Mrs. Mary Boggs, of New Brighton, Mrs. Sarah Burns, of Allegheny, Jefferson, of Martin’s Ferry, Edward of Portsmouth, O, Mrs. Katherine Manley, of Red Oak, Iowa, Gabriel A. of Bellaire and Mrs. Rebecca Canby, Mrs. Ann Sweetland and Miss Emma living in this city. There are thirty-seven granchildren and one great grand child. Mrs. Lopeman still survives her husband. Mr. Lopeman was a member of St. John’s Lutheran Church and was a man respected by all who knew him and trusted by his employers. He goes to rest after a long life, and his friends mourn but not without hope. The funeral took place at one o’clock, having been delayed two hours, waiting for the arrival of friends and relatives from distance. Rev. Theo. P Ebert was the officiating clergyman, and the pall bearers were Henry Schoenias, Henry Lucas, Sr., John Strott and Henry Noltemeier. Jane’s husband James McDowell died before 1850. In the 1850 census, Jane was living with her son James in Summerhill, Crawford, Pennsylvania. i. John McDowell b. 1819 Pennsylvania; m. Eliza Stanley ( b. 1820 New York – d. 1896 in Crawford Co., Pennsylvania) In the 1870 census, John and Eliza were farming in Summerhill, Crawford, Pennsylvania with their son Bradford and daughter Arvilla. ii. 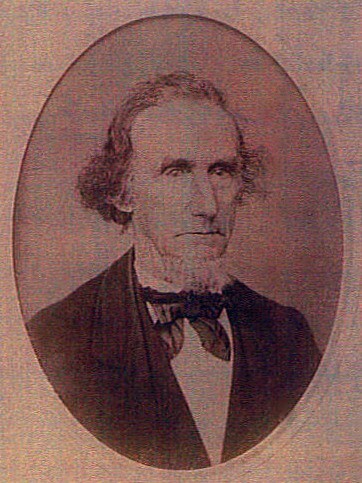 James P. McDowell b. 1822 Pennsylvania; d. bef. 1870 census; m. Mary Craig; ( b. 12 July 1818 Pennsylvania) In the 1880 census, Mary was a widow in Conneautville, Crawford, Pennsylvania keeping house with Rettie Mc Dowell (b. 1858) and Frank Kendel (b. 1861) Frank was a cheese maker. ii. Caroline McDowell b. 1829 Pennsylvania In the 1850 census, Caroline was living with her brother James in Summerhill, Crawford, Pennsylvania. John’s wife Nancy Work was born c. 1793 in Pennsylvania. She was the sister of Hon. Judge John Work, of Crawford County, her family being one of the first in the township. 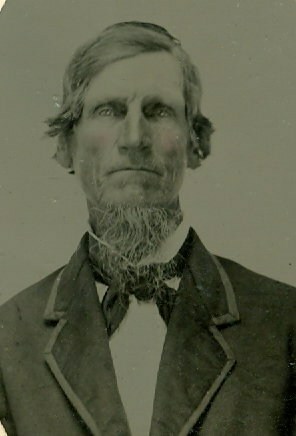 John Johnston came to America with his father when six years of age, having been born in 1791. His father settled with his young family in the wilds of Vernon Township, and many are the bear and wolf stories told of those pioneer days. John and Nancy (Work) Johnston had ten children, seven of whom survived in 1885. 1840 Census – John Johnson was living in Vernon , Crawford, Pennsylvania. No record for Alexander age 20 in 1850 or George age 15 in 1850. 1860 Census John was farming in Vernon, Crawford, Pennsylvania (Farm worth $9,000, personal estate $1,000) The children Arthur, Patterson, Martha and George were all still living at home. iv. William W. Johnston b. 6 Apr 1821 Pennsylvania; d. Bef. 1900 census; m. 3 Jun 1847 to Adeline Stockton Cotton (b. Jul 1826 Pennsylvania – d. 25 Dec 1907 Denny Cemetery, Crawford County, Pennsylvania, Plot: Section C Lot 26) Her parents were Joseph Cotton and Eliza Beatty; one child has blessed this union — Sarah A. Mrs. Johnston was the second in her father’s family, which is one of the representative families of the township. Her great-grandfather fought in the Revolutionary war, and her grandfather in the war of 1812. Mr. Johnston was Assessor in 1855 and 1875, also Overseer of the Poor before the erection of the poor-house. Although he never signed the pledge, he was never drunk in his life. He has never been sued as he always promptly met his obligations. In the 1880 census, William and Adeline were farming in Vernon, Crawford, Pennsylvania. Adeline’s mother Eliza (b. 1801 Pennsylvania) was living with the family. Ellen C. Fuller was the daughter of Alonzo Fuller and Angeline Whiting, the eldest child in a family of nine. Arthur and Ellen had four children: John E. (d. bef 1885), Alonzo M. (d. bef. 1885), Jesse W.(b. 1867) and Arthur L (b. 1870). Arthur was a farmer in P. O. Watson Run. He filled the offices of School Director, Supervisor of Roads and other township offices. He was a Ruling Elder of the United Presbyterian Church and a consistent Democrat. Watson’s Run United Presbyterian Church [13594 Harmonsburg Rd, Meadville, PA] was organized by Rev. J. B. Waddle, January 30, 1869, with a membership of thirty-two, nineteen females and thirteen males, the latter as follows: Arthur Johnston, M. A. Calvin, David Nelson, Thomas Nelson, Samuel Beatty, John Beatty, James Irvin, Jacob Work, Alexander Davis, Robert Montgomery, John McKay, William McKay and James Morrow. Arthur Johnston and M. A. Calvin were elected Ruling Elders. Seventy members have since been added, bat seventeen have died and twenty-five removed, leaving a membership of sixty in 1885. The church building, 35×55, was erected in the northwest part of the township on Tract 52, in 1870 at a cost of $2,200. The congregation had various supplies until June, 1873, when Rev. S. M. Black was ordained and installed pastor, remaining one year. Supplies again filled the pulpit until October 12, 1875, when Rev. Joseph McNabb was installed. vii. James Johnston b. 31 Jan 1827 in Pennsylvania; d. bef. 1927; m. 11 Apr 1854 to Mary Matilda Lefever (1829 Pennsylvania – 1890) In the 1880 census, James was farming in Summit, Crawford, Pennsylvania. viii. Martha Johnston b. c. 1829 in Pennsylvania. xi. Alexander Johnston born c. 1830 in Pennsylvania (Farmer) ; d. Aft 1850 census, Vernon, Crawford, PA.
Here’s a clue towards Letitia’s parents. In the 1870 census, William H Miner twelve years old and was living with John and Nancy Johnston relatives of his sister-in-law Calista Jane Latta in Kinsman, Trumbull, Ohio. William’s mother Charity Webber had died in 1868. Evidently, Philo wasn’t very good at taking care of children by himself. The Johns(t)on family were also living in Kinsman, Ohio, ten years earlier in the 1860 census: All were born in Pennsylvania, except for the youngest Amand/Emma who was born in Ohio. Addison Root was listed as a male domestic. Ten years earlier in the 1850 census, the Johns(t)on family were living in Greene , Mercer , Pennsylvania. Mercer Township is in the Northwest corner of Mercer county and touches Crawford, County. This entry was posted in -8th Generation, Immigrant - Scot-Irish, Line - Miner, Pioneer and tagged Crawford County Pennsylvania. Bookmark the permalink.